AFTER ZIGGY Stardust, The Gouster soul boy, and The Thin White Duke, where could Bowie possibly go next? The answer lay, not so much in the mask of a character, rather it lay in a location, one where Bowie could feel free to be, perhaps, a little more himself. Bowie's next evolution was signposted on 1976's Station To Station, on it's title track which fused hard rock with a kind of metronomic rhythm the world now knows as 'motorik' or, the NEU! beat. To hammer home the point, Bowie announce: "The European cannon is here! ", a declaration, as much to himself, as to his audience, that, for the sake of his mental and physical health, never mind his career, it was time to get out of the USA, and head home. Arriving in London he greeted fans at Victoria Station, where he was alleged to have given a Nazi salute - it was no such thing, but the myth persists. At the time he told interviewers that whatever he would do next it would not be rock music - or certainly not rock as the majority of people understood it. Bowie was ready to do something no one, perhaps not even himself, expected. 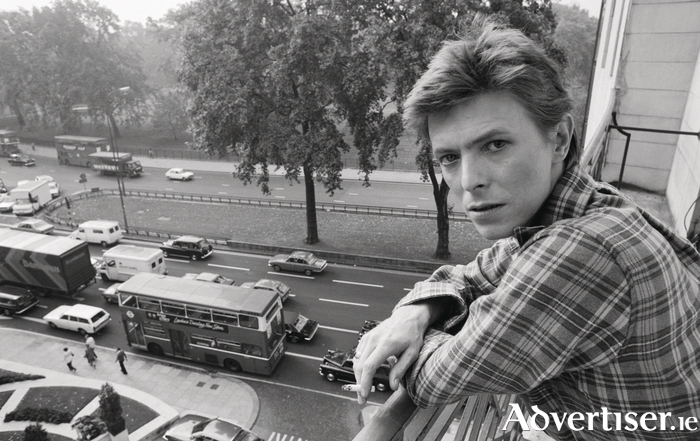 This extraordinary era is now collected in the latest Bowie box set, A New Career In A New Town (1977 – 1982 ). Bowie had become excited by the revolutionary form of music being created by contemporary avant garde German rock bands like NEU!, Cluster, Harmonium, and Kraftwerk. Dubbed Krautrock by English music critics, Bowie was impressed by the overall scene's propulsive, yet disciplined, rhythms and aggressive noise, as well as by its Kosmische Musik strand which favoured ambience and serenity. Keen to do something along these lines, Bowie summoned long time collaborator Tony Visconti as producer, and Brian Eno, whose 1975 albums, Another Green World and Discreet Music, saw the former Roxy Music man make his own moves towards the ambient. At this time, Bowie had moved to the FDR enclave of West Berlin (on the basis it was "one of the few cities where I could move around in virtual anonymity...it was cheap to live" ) surrounded by the Wall and the Communist GDR. And while its atmosphere would pervade the forthcoming album, recording took place in Château d'Hérouville, outside Paris. What followed was one of the most extraordinary works to ever emerge from the rock canon, and a permanent contribution to music itself. Low (5/5 ), released in January 1977, contained on its first side, a series of songs, instrumentals, and song fragments, none of which had much interest in following any traditional songwriting structures or motifs. Despite its unconventional nature, opener 'Speed Of Life', hit single 'Sound+Vision', and 'Breaking Glass' (an ungenerous ode to wife Angie ) had great swing, energy, and exuberance. By contrast, side two was impossible to classify as rock, staring with the eerie, forbidding, sinister 'Warszawa' (featuring the sole vocal on side two, which saw Bowie chanting and exclaiming in non-existent words ). 'Art Decade' was his response to the atmosphere of a divided city, as was 'Weeping Wall', which clearly showed the influence of avant classical composers Steve Reich and Terry Reily. Low declared all bets were off. Indeed the marketing campaign for "Heroes" (5/5 ), released in October 1977, recognised as much, declaring, quite accurately: "There's old wave, there's new wave, and there's David Bowie". "Heroes", recorded at Hansa Studio ("by the Wall" as the song says ), followed a similar structure to Low, but the songs were more fleshed out and fully realised - as exemplified by the peerless title track, possibly Bowie's greatest song. Robert Fripp's guitar gave muscle to that song as well as to the more riff laden 'Joe The Lion'. The inspired instrumentals were a study in contrasts: 'V-2 Schneider' was propelled by bounce and energy; 'Sense Of Doubt' was a doom laden, descending, piano motif, with ambient interjections; which segued into the sublime reverie of 'Moss Garden', a blissful sonic bed over which Bowie improvised with a koto - a kind of Japanese banjo. Although one of the great live performers, both Bowie's official live albums failed to capture that spirit. Stage (2.5/5 ), released in 1978, was recorded in Philadelphia, Boston, and Providence, but bizarrely producer Toni Visconti abandoned the show's running order, and arranged the tracks chronologically, thus removing the concert's original dynamic and impact. The tracks were also mixed to sound as close to the originals as possible, while crowd noise was reduced, resulting in a bloodless affair. The 2017 remix (3.5/5 ), restores the original running order, which makes for a more satisfying experience as the glacial instrumentals vie with the full on Ziggy era rockers. Still, 'Soul Love' being rendered as MOR disco cheese remains unforgivable. Satisfied with his experiments in ambient music, Bowie sought to return to more song orientated work for 1979's Lodger (4/5 ). This put Eno in a sulk and his subsequent disparaging of the album, a poor mixing job, and a general critical consensus that it is lacklustre, has served to make it Bowie's most overlooked album of the era. Lodger (which gets a new mix from Visconti for this collection ) has had the last laugh, though, as its mix of world music, left field pop, and unconventional approaches (Bowie famously ordered his band members to swap instruments for 'Boys Keep Swinging' ) has seen its influence run deep from Talking Heads then, to Ariel Pink today. Now based in New York, Bowie set to work on his new album for the new decade. Scary Monsters and Super Creeps (4/5 ), released in 1980, was his most guitar orientated work since Diamond Dogs, particularly on the biting title-track, 'Fashion', and the Bo Diddley-esque 'Up The Hill Backwards'. Overall it showed a confident Bowie, well aware of his position as father of the emerging post-punk, new wave, new romantic, and alternative rock movements, all summed up in the album's towering achievement - 'Ashes to Ashes'. In the following two years, Bowie took his foot off the pedal to allow his contract to former manager Tony DeFries run out. Work from this period features in this collection's bonus album Re:Call 3 (3/5 ), such as 'Under Pressure' with Queen and the wonderful Baal EP of Bertolt Brecht songs. The remainder includes edited for 7" versions of the era's singles, and Bowie's unforgivably horrendous desecration of Brecht/Weil's 'Alabama Song', which should never have been let near the light of day. A nice addition, though, is the "Heroes" EP featuring the German and French language versions of the song. While A New Career In A New Town does not have the bounty of lost or previously unreleased tracks of the previous collections in this series, it is a magnificent record of Bowie's most daring and groundbreaking work, arguably his most lasting and enduring musical achievement, and proof why he remains one of the most significant artists - to have worked in any field of the arts - of the last 50 years.